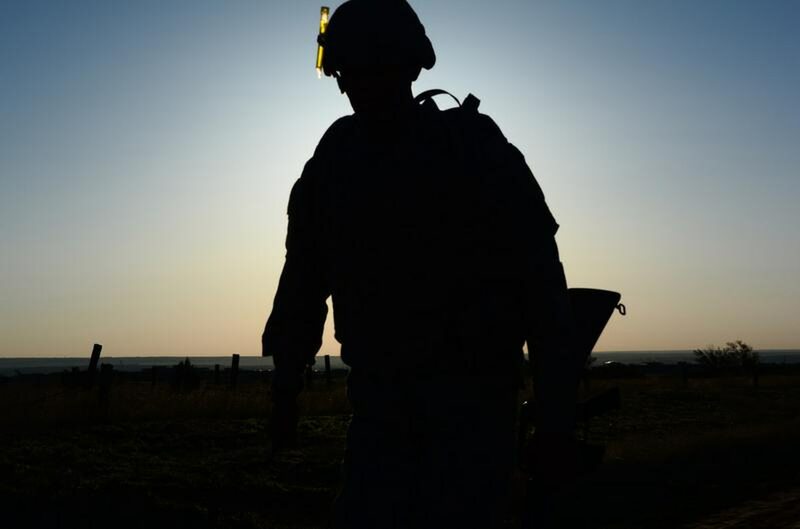 The silhouette of a Soldier as he runs to the turnaround point of a 12 mile ruck march, May 14, Fort Carson, Colo. The ruck march was one of the objectives during a three day pre-air assault course held by the 43rd SB, May 12-14. Roughly two-thirds of veterans are likely to leave their first post-military job within two years because of problems like low job satisfaction and limited opportunities for advancement, according to a new survey by employment specialists. The report, from VetAdvisor and Syracuse University's Institute for Veterans and Military Families, confirms concerns from many veterans groups that post-military employment problems don't end when troops land their first civilian job. According to the research, roughly 44 percent of veterans who responded to the survey left their first civilian job within a year of employment. Another 21 percent left after one to two years on the job. Veterans blamed the quick job changes on a lack of advancement opportunity in their offices, tedious work requirements and finding that the job is a poor match with their military skills. But on a more positive note, more than 43 percent of veterans surveyed said they left their job for another, better position. VetAdvisor officials said the results underscore the need for employers to focus not only on veteran recruiting but also on ways to hold onto those employees. The company provides support services for both veteran employees and corporate human resources officials dealing with military/veterans issues. "A lot of people just haven't really thought about retention for veterans they hire," said Jennifer Roseman, vice president at the company. "Once you have them on board, there are things you could and should do ... to help them have a meaningful career." Roseman said researchers weren't surprised by the results, but believe the information solidifies the need for educating businesses on understanding military culture and adapting to veterans' unique skills. "The cost of turnover is very high, and it's frustrating for veterans not to succeed in that first job after the military," she said. "So we hope these findings can help change that discussion and help veterans find quality and meaningful jobs right from the start." IVMF officials said results of the survey, conducted earlier this year, also show the need for hiring managers to better match job requirements with veterans' qualifications, to ensure they aren't bored or underutilized in their civilian posts. Officers were more likely than enlisted troops to stay in their first post-military position, but more than half of officers also had moved on within two years, according to the survey, which included responses from nearly 1,500 veterans earlier this year.